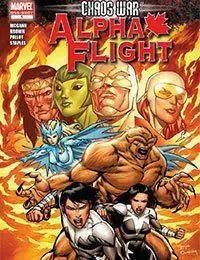 CHAOS WAR tie-in!<br />ALPHA FLIGHT IS BACK! Original members Guardian, Vindicator, Shaman and Marina are back from the great beyond to join their team in battle larger than life or death! As CHAOS KING and his army cut a path of destruction across the Marvel Universe, the return of Alpha Flight may just be what the heroes need to turn the tide. So why does one team member want to put Alpha Flight back in the grave?